The Seaview 180 Degree in the past had a leg up to the Easybreath by having a GoPro mount as part of the mask. No fussing around with 3rd party mounts or having to hold the GoPro in your hands. You put the camera on the mask and films what you see. It’s hard to see anything easier than that. In the latest version the Subea Easybreath mask offers an ingenious optional mount for the GoPro camera. It snaps onto the snorkel and secures the camera. With this add-on the makers of the Easybreath snorkel mask removed any advantage which other masks had in the past! They make both masks from the best materials. Both snorkel goggles have a lens made from scratch and shatterproof polycarbonate. This makes your purchase one you’ll enjoy for a long time. 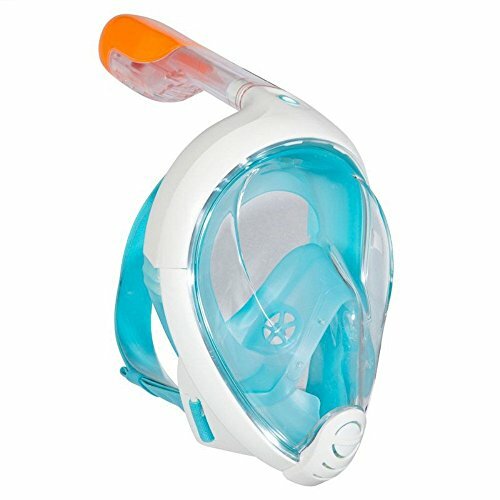 The first full-face snorkel mask was the Tribord Easybreath. It took the snorkel market and turned it upside down. The design was simple and removed many obstacles that existed in the past preventing people from taking up snorkeling. The major news was the much larger field of view through the panoramic lens and the ability to breathe through mouth and nose. All those features combined with high-quality materials provide a comfortable fit. That is also the reason the Easybreath became the best choice for any snorkel mask. Until another competitor made a mask of similar quality yet added the GoPro mount. That was the Wildhorn Seaview 180. And that’s when it started that numerous people looking for a top-quality full-face snorkel mask turned to the Seaview 180 Degree instead of the Tribord Easybreath. Now, that’s not to say nobody gets the Easybreath anymore. Far from it. Overall, it is still one if not the most bought snorkel mask you can find. The Seaview models in the past had a rounded lens while the Subea Easybreath always came with a flat lens. Wildhorn also switched to a flat lens in the latest model(s). The differences between a flat and a rounded lens are negligible but most prefer the flat variant. And for comfort, visibility and quality, it still sets the gold standard. Together with the Seaview 180 and not by itself anymore. Please have a look at our in-depth review of the Subea Easybreath at this link. In addition, you can also check out our detailed evaluation of the Wildhorn Outfitters 180 Degree. You might ask why would you even consider getting a Tribord when the Seaview is just as good and offers the GoPro mount? Well, you can find a few good reasons. If you don’t have a GoPro, then you won’t need to have a mask with a mount. GoPro might come out with a new camera next year which requires a different mount. Likely? Not really, but you never know… In that case you’re better off with a 3rd party mount as you can switch it out versus having to buy a new mask. That’s where the new camera mounting accessory for the Subea Easybreath mask makes sense. First, if you don’t own a camera you won’t need a mount. Second, if GoPro changes the mount you won’t have to throw away your mask but instead you switch out the mount and you’re good to go. You’ll need a matching mount for such a new mounting system. In the past the biggest point for getting a Tribord mask was that it came in more sizes. Even for smaller children you could find a matching size. The latest version only comes in two sizes and while sufficient for most people, it can be challenging to find a size that matches when you have a tiny or large head. An advantage of the Tribord is that it is impossible to fog it up. The breathing mechanism is so clever that there’s usually never any fogging inside the mask. The Seaview is nearly as good but there are situations where it can fog up. That can be annoying as you have to take it off and get the fogging taken care of. Another advantage of the Tribord is that the tip of the snorkel is a bright signaling color. At first glance this might not seem important at all but if you’re snorkeling in crowded waters then it can be a good thing to have that bright orange part sticking out of the water and making you visible to others around you. 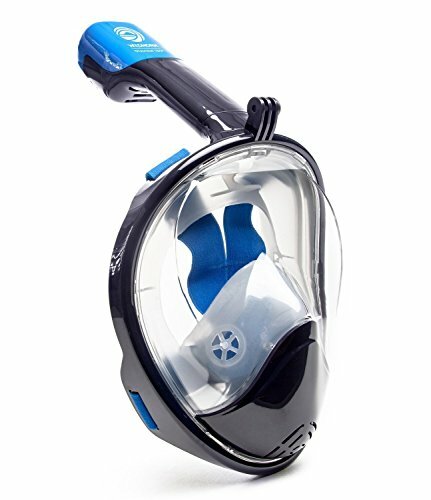 If you have a GoPro and want to use it to make videos of your snorkel experience, then the Seaview 180 Degree is the mask to go with. Otherwise, it depends. Both masks are of similar quality and make. If you are a heavy breather, then the Easybreath might be better suited for you. It practically never fogs up and breathing heavy won’t change that. The Seaview sometimes has a slightly higher chance to get foggy. Yet, for small faces the Tribord has better sizing and might fit more comfortable. The bright orange tip of the snorkel is a slight advantage. No matter which of these two masks you pick, you’ll be happy with your purchase. Both are priced around the same and are overall very affordable. Both will provide you with an excellent snorkeling experience. 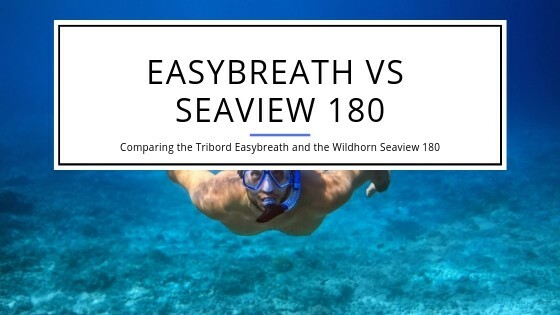 You can check out how the Easybreath fared against the Ocean Reef Aria in this comparison. Additionally, we compared the Ninja H20 to the Tribord goggles. 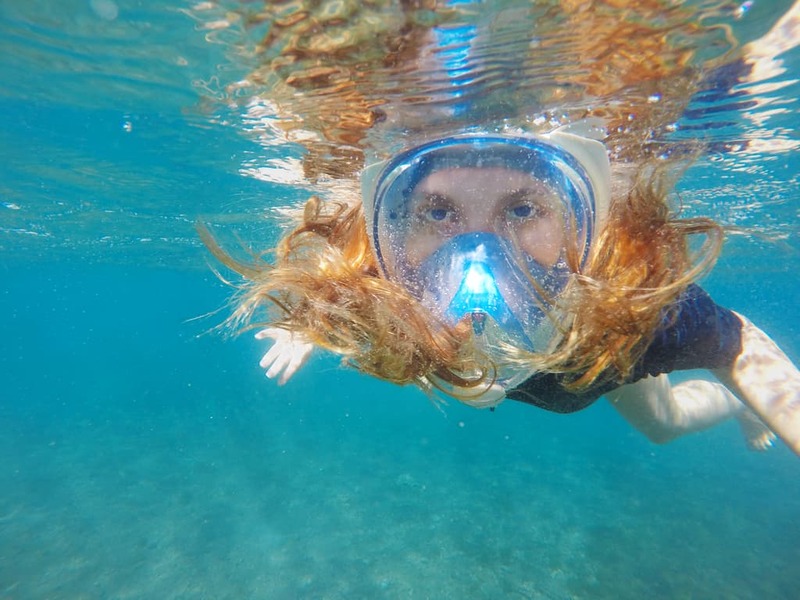 With more and more full face snorkeling masks being available it is prudent of you to get a good idea of important features and considerations you have to take into account. Our list of the best full face snorkel masks contains a buyer’s guide as well as our top picks for these kind of goggles. You can find it here.